TORONTO (AP) — Even though his team was ahead by seven points after the opening quarter, Orlando Magic coach Steve Clifford didn’t like what he’d seen on defense. Turns out he was right to be worried. Danny Green scored a season-high 29 points, Kawhi Leonard and Serge Ibaka each had 15 and the Toronto Raptors clinched their sixth Atlantic Division title Monday night, rallying from a double-digit deficit to beat the Magic 121-109. Green piled up the points despite jamming his left thumb in the first quarter. X-rays were negative but Green was not available following the game because he had left to undergo additional testing. Green connected on 11 of 15 attempts, going 7 of 10 from 3-point range, before sitting out the final quarter. First-year coach Nick Nurse said he was proud to help hang another banner in Toronto. Toronto trailed by 11 points early in the second before turning the game around with a 31-10 rally before halftime. The Raptors pulled away after the break, leading by as many as 24. Nikola Vucevic had 13 points and 13 rebounds, but the Magic lost for the second time in three games after winning their previous six. Fournier scored 21 points. “We just didn’t play good defense all game long,” Vucevic said. Orlando remained a half-game behind Miami for the eighth and final playoff spot in the East. The three teams ahead of Orlando all lost Monday. Miami lost at Boston, Brooklyn lost at home to Milwaukee and Detroit lost at Indiana. Asked whether he paid attention to the Magic’s closest competitors, Fournier lifted his cellphone to reveal an NBA scoreboard. Toronto won its fourth straight and improved to 31-9 at home. Only Milwaukee (32) has more home wins this season. Up 36-29 after one, Orlando led 42-31 on Fournier’s basket at 10:22 of the second before Toronto responded. The Raptors took their first the lead on a four-point play by Gasol at 1:49 and were up 62-52 at halftime. “Once our offense stopped clicking, they took a big lead,” Vucevic said. Magic: Orlando shot 12 for 33 from 3-point range. … Wes Iwundu shot 7 for 7 and scored 16 points. … Canadian Khem Birch scored 11 points off the bench. Birch is from Montreal. … Former Raptors guard Terrence Ross shot 2 for 10 and scored six points. Raptors: Leonard paid tribute to slain rapper Nipsey Hussle with a message on his shoes. Hussle was fatally shot Sunday outside the clothing store he founded to help rebuild his troubled South Los Angeles neighborhood. … F OG Anunoby (concussion) missed his third straight game. 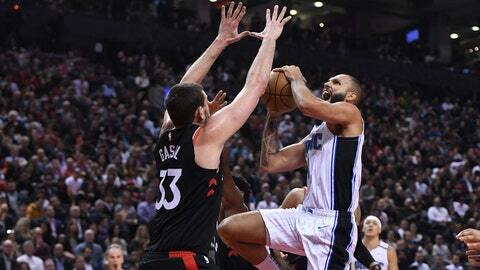 … Toronto’s 29-point defeat at Orlando last Dec. 28 is its most lopsided loss of the season. Green made his first five shots and scored 16 points in the first, going 4 of 5 from long range. Green’s previous high this season was 24, set against Memphis on Jan. 19, when he made a career-high eight 3-pointers. He scored a career-high 33 against Phoenix on April 11, 2014. Toronto F Chris Boucher picked up a pair of G League awards Monday, winning MVP and Defensive Player of the Year. He’s the first player to win both awards in the same season, and the first international player to be named MVP. Boucher, 26, is from Montreal. He averaged 27.2 points, 11.4 rebounds and 4.1 blocked shots in 28 games with Raptors 905. Monday marked the 18th anniversary of Tracy McGrady’s first game back in Toronto after leaving the Raptors to sign with Orlando. Booed all night by a capacity crowd, McGrady scored 24 points as the Magic won 104-101. Magic: Host New York on Wednesday. Raptors: At Brooklyn on Wednesday.